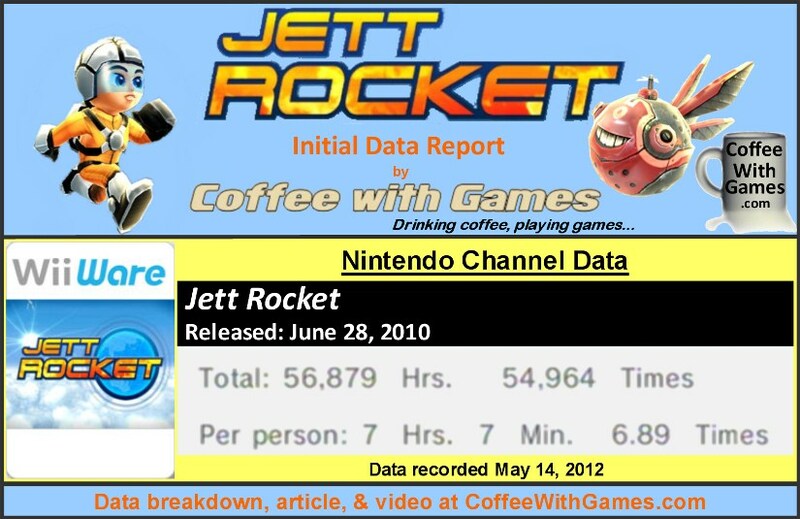 Coffee With Games: WiiWare Wednesday - Jett Rocket Flies Onto the Scene! WiiWare Wednesday - Jett Rocket Flies Onto the Scene! 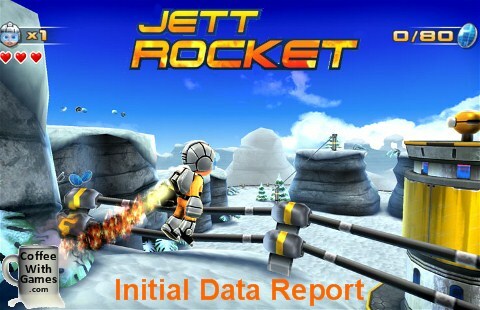 Jett Rocket was released through Nintendo's WiiWare service on June 28, 2010 at a $10 price point. The game was developed and published by Shin' en Multimedia and is classified as a "3D Action Adventure" for 1 player. The game received an ESRB rating of "Everyone" with "Mild Cartoon Violence" listed as the only content for gamers and parents to be aware of. How many hours have U.S. Wii owners reported playing Jett Rocket with 686 days of game-play reported, and what is the first hilarious (to me anyway) search result when searching "Jett Rocket" on a famous online retailer? Let's take a look! 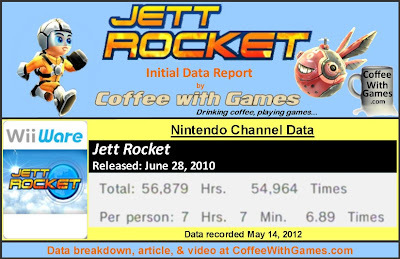 Jett Rocket has approximately 7,977 Wii owners that have reported game-play data using the Nintendo Channel, and the average play-time per day/session reported is 1 Hour 1 Minute. The game's "professional" review score average is 69.90%, based on 10 reviews from GameRankings.com. Jett Rocket's U.S. release has made Shin' en about $79,770 before taxes and profit sharing, just based on the number of players that have reported data and the game's $10 price point over the last 2 years. While GameRankings.com does average together most of the larger sites, it often misses sites that have been around for a few years that review games regularly, and in this case, I would like to highlight one of those reviews. WiiLoveIt.com has been around for many years now, and interestingly enough as I was piecing together this data report I went to the developer's site for the game. I was looking for assets and just browsing the site in general, when I stumbled upon the developer's "review" tab for the game, and the very first review they have listed is from WiiLoveIt.com, which was NOT included in GameRankings.com's average. If you would like to read KnucklesSonic8's review for Jett Rocket, you can do so HERE. Jett Rocket has a free demo available on the Nintendo Shop Channel, and I highly recommend you to download it if you think you might be interested in the game even a little. I have played through the demo twice now, once last night, and found it very enjoyable both times. I have not purchased a WiiWare game in a while, but Jett Rocket's demo may have sold me on another one now. Again, Jett Rocket's demo is still available on the Shop Channel as I mentioned above, and the demo plays well and the game looks really good considering the limits of WiiWare games. Considering the game's reported average play-time "Per person" is just over 7 hours, I think the asking price of only $10 is a steal from my time with the demo. Yes, that is an inflatable Boba Fett jetpack. 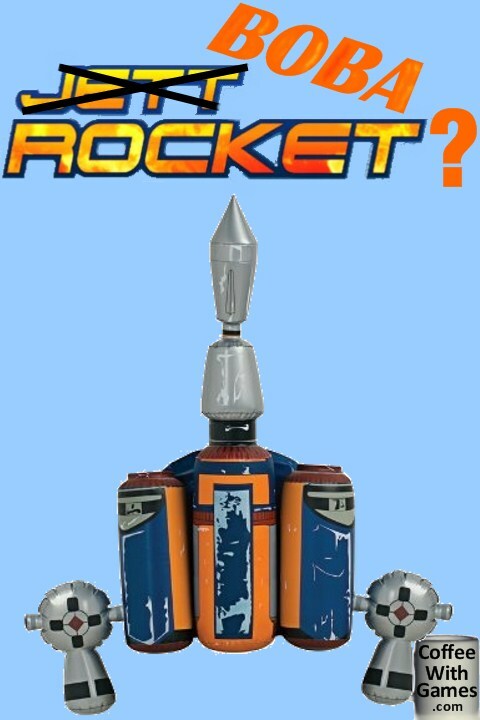 While Jett Rocket was not listed on Amazon, I thought the result was funny. Have any of you purchased and played the full retail version of Jett Rocket, and if so, how many hours did it take you to complete it? If you completed it what did you think of the game, and did you finish it by finding all the secrets and hidden items in the game? BTW, was your username perhaps inspired by a show like Survivorman? "Interesting article... ! I find it sad that out of 90 million Wii consoles that only about 7,00 purchase games like jett rocket..."
Well, if you're not familiar with the data shown here, just remember this is for U.S. players only...so not counting Canadian, Mexican, Japanese, etc., it's just region specific...and also, the number of Wii owners that report the data is a smaller percentage, and not 100%. But it can give us a nice little glimpse at how much the players that bought it, averaged with the game...and how well it's doing. Considering it has shown up on WiiWare is good, and means some people are still buying/playing the game and reporting it. It's definitely not the fastest debuting WiiWare game, but it has debuted...which is good. I agree about it being "dead" now, and I look at Nintendo for that. It seems many developers are looking elsewhere now, not just because the Wii seems to be on its way out...but because of some of Nintendo's own policies and practices, and that spreads about the indie dev communities. I see... ... US only! Thats still 45 million wii's though... I'd be curious to see numbers of the best selling downloadable games on all systems.... from what I hear the numbers on downloads are not reported... so the findings are scarce... this gives us some glimpse of what happens in the digital downloads world.... I'm really hoping that Nintendo Does away with/Changes some of it's policies in that aspect... Wii U! No problem. It was really ironic, as I was planning on this post since Monday when I captured the data for this week; then yesterday the post had the comment issues going on with only your comment. I want this, but I will not spend money on the Wii Shop Channel until I know my downloads will transfer over to the Wii U.
I thought Nintendo had confirmed this already? Did they not? Ohhhhhhhh dear...Nintendo, Nintendo, Nintendo...clear this up ASAP please. "we have.. it's a beautiful 3d platformer thats very similar to mario galaxy.. my only complaint is its total length.. took maybe 4 or so hours to finish... but i'd say it might take a little longer to get all the coins to 100% it... its worth the 10 bucks for sure.. heck, shin'en studios deserves a freakin medal for stuffing what they did into the archaic 40mb limit for wiiware.. and speaking of shin'en, they have another great game that uses the same engine as this one, it's called FAST Racing League.. it's addictive and frustratingly difficult, it a good way... i recommend it to anyone that loves "Wipeout" style racing games.. can't wait to see what else these come out with in the future"
"took maybe 4 or so hours to finish... but i'd say it might take a little longer to get all the coins to 100% it"
Interesting about your 4 hours with the game, which means the average players must be collecting all the coins and hidden items in the game, or playing through it at least twice according to the average play-time reported. I am familiar with Shin' en's other WiiWare game FAST Racing League, as well as Art of Balance. I have played the Art of Balance demo, and thought it was an interesting "puzzle" type game. As for the transfers, I know it's possible if you have a Nintendo account setup online, through Nintendo.com, that it registers the games you download automatically if you have registered your system on it. Being that the DSi was able to transfer to 3DS, I would imagine the Wii to Wii U will be able to do the same...though the DSi and DSiWare came out after WiiWare (right? ), so could that possibly mean the programmers at Nintendo missed some hole and transfers to the Wii U won't happen? I don't know, that's not even a question that should be up for debate though, as that effects (or affects? English major around here?!) current WiiWare sales as shown with superphillip32's comment.